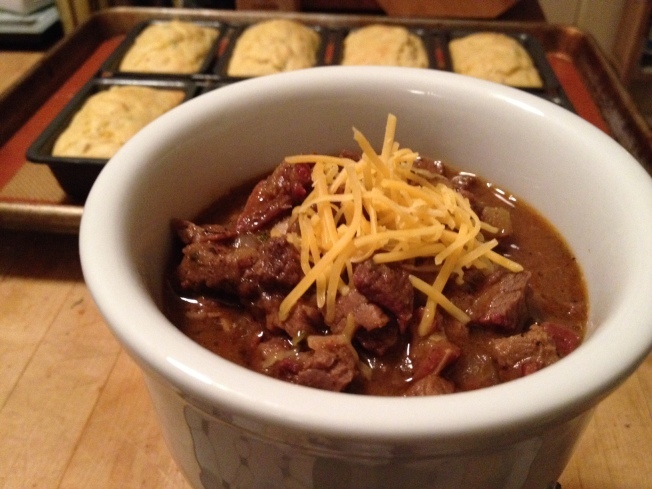 Celebrate the Super Bowl with a hearty pot of chili and jalapeño cornbread. Watching the Super Bowl is always a great time for a hearty food fest. The centerpiece of my party will be a big pot of chili made with 4lbs of smoked eye of round that’s been marinated in my own dry rub mix. Smoking the beef before combining it with other ingredients infuses a wonderful hickory flavor to the chili. And, because there are no beans or tomatoes in this recipe, it’s all about the meat. This chili does have a bit of a kick to it from the dry rub and the jalapeños. But, by adding toppings like sour cream and cheese, the spiciness can be softened a bit for those who don’t want it too hot. I traditionally serve this up with jalapeño cornbread and I’ve provided the recipe belwo. You can also offer up hot dogs to your guests who might want to enjoy this recipe for chili dogs. Rinse beef in cold water and pat dry with a paper towel. Place in a large sealable bag. Pour dry rub mix in the bag. Seal the bag and shake to coat the beef. Open the bag, squeeze out all of the air and reseal it. Refrigerator overnight. The next day, removed the meat from the refrigerator 30 minutes before placing it in the smoker or grill. If you have a smoker, follow the basic directions and smoke the beef at about 225 degrees F for 2 hours or until beef is medium rare in the center (about 120 degrees F). If you are using a grill, place a small number of coals to the side and add wood chips (hickory works well). Place the meat in the center of the grill and smoke on a low temperature for 2 hours. Remove beef from the smoker and let it rest until cool enough to cut. Cut off any excess fat, then cut beef into very small 1/4” cubes. Set aside. Meanwhile, cook bacon in a large stockpot over medium heat until bacon is slightly crisp. Add onions, green pepper, jalapeños and garlic. Sauté until onions are translucent, about 5-7 minutes. Add cumin, oregano, paprika, and chili powder. Sauté for an additional 2 minutes. Transfer beef to stock pot. Add beef broth. Bring mixture to a boil and then reduce heat to a very low simmer. Place the corn masa in a bowl and slowly stir in 1 cup of water. Mix thoroughly to remove any lumps. Add mixture to chili. Simmer chili covered, wit the top slightly ajar, for about 1-1/2 hours, stirring on a regular basis. Be sure to keep the temperature as low as possible. Add more water if necessary to keep beef just barely covered. This chili tastes best if you can refrigerate it overnight and then reheat it the next day. Mix ingredients together and either grind in spice grinder, mini food processor or in a mortar and pestle. Store in an airtight container. Also, consider making a larger batch of this recipe to use in future dishes. Cream together butter, sour cream and sugar in a mixing bowl. Add eggs, one at a time, followed by buttermilk and jalapeños. Separately, mix together cornmeal, flour, baking powder, baking soda and salt. Gradually incorporate the flour mixture into the wet ingredients. Fold in the corn and cheese. Mix well. This is a thick batter and an easy way to portion it out is to transfer the batter to a large sealable bag and pipe it into the pans. Lightly coat an 8-slot mini loaf pan with baking spray. Cut a 1” corner off one end of the bag and squeeze batter into the slots, distributing evenly. Flatten batter in each slot with the back of a spoon. Place pan on a larger baking sheet and bake for about 20 minutes, or until a toothpick or wooden skewer inserted into the center of one of loaves comes out clean.